Lovely 3 bed, 2.5 bath detached home with a double car garage in the family oriented village of Russell. Built in 2013 (still under Tarion warranty) this home has nice upgrades including central vacuum & accessories, central air conditioning and a rough in in the lower level for yet another bathroom! On the second floor, the massive master bedroom has a huge walk in closet and 4 piece ensuite bathroom. A generous landing, two other good sized bedrooms and another full bathroom complete this floor. The windows are big and hence the lighting incredible. The main floor is very open concept. A gorgeous front entry way and big, bright foyer greets you. From here, there is access to the fair sized main floor bathroom which is also (conveniently) the laundry room and the door to the garage. The kitchen is bright, modern and has an overhang of the counter that could easily fit three breakfast bar stools. It is open to the dining room and family room. All of the appliances (fridge, stove, dishwasher, microwave/hood fan, washer & dryer) were newly purchased with the house and are included in the sale. The lower level is set to be finished and has a rough in another bathroom. The windows are big enough for another bedroom to be built down there as well. Or just some more fun, relaxing space. Walking distance to all amenities (including the brand new huge Foodland currently being built a few blocks away), shopping, schools, nature trails, churches, drug stores, fitness facilities, etc and yet only 25 minutes to downtown Ottawa! 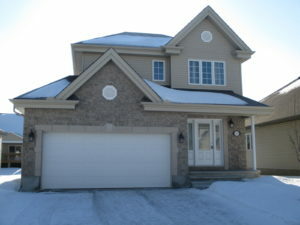 One of the bus stops for the commuter bus going from Russell to downtown (and Gatineau) is just blocks from this home. And it is in an ideal part of the development, well off the beaten path of the main arteries of traffic.